Post Barsby Life Images on Instagram for prize! New activities to get connected! Click Learn More! The NLSF is a registered, community-based charity that solicits scholarships & bursaries for Grade 12 graduates with the high cost of post-secondary education. Central online registration for the 2018-19 school year begins on Wednesday, January 10, 2018. Detailed information, frequently asked questions as well as details about the process is available on the district's website at www.sd68.bc.ca. The Cafeteria is Open Today! Our VIU advisor is here today to meet with GRADE 12 students one-on-one. If you have any questions, please sign up for an appointment with Shawn in Room 209. He will also be here on Monday, April 29 in the morning to run a registration session for students wanting to register for VIU. Please sign up in the Counselling Office asap. Also…please pop into the office to pick up a Valedictorian Nomination Form… and if you missed the assembly on Tuesday please come into the office to pick up your tshirt order form and a Grad Song Nomination Form…it also contains a grad Information Newsletter with important information and dates and times for upcoming graduation events. If you cannot make it please see Ms Moslin. Next weeks schedule is Tuesday and Thursday. Are you Volunteering at Earth Day this Saturday… If so, please come to a brief meeting at lunch in room 117…or talk to Ms. Nelson. Any international students that would like to meet with Kelsey, please go to Chandler Hall at lunch today. 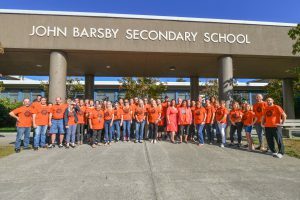 Day of Mourning BC Schools Project – In 2017, 6,650 young workers were injured on the job in BC. Young worker injuries represent a third of the total work place injuries in BC. This Sunday, April 28th, is the National Day of Mourning for Workers Killed and Injured in the Job. It is a day when we recognize and remember all those who have lost their lives just trying to provide for themselves and their families. Many students at this school have part time jobs, and all of us one day will have full time careers. As young workers we should protect ourselves from workplace dangers by knowing the safety procedures at work and by knowing our rights. Remember: Everyone has the right to refuse unsafe work. On Saturday, April 28th, remember those who have been injured or have died at work. Please, mourn them, but don’t be one of the mourned—stay safe at work. Photography Contest – Please submit any photos you’ve taken that showcase our school and post them on Instagram with the hashtag: #barsbylifephotography. The winner will be announced on May 1st. Check the Barsby-events Instagram for more information! Attention grads – Please complete an order form for Graduation cap and gowns and return it to Ms. Rispin in the Counselling Office. Forms are available in the Counselling Office and Main Office. Study Hall – Need help with your homework. Come to study hall – Tuesdays and Thursdays after school in room 234. Help with any subject…and snacks too. Please do your best to be on time every day! Try your Best…Do the Right Thing…Get Better Each Day!! There will be an important Track and Field meeting today, Wednesday at lunch. Please meet with Mr. Hart and Ms. MacDonald at the beginning of lunch today. Chesapeake Shores Filming in Chandler Hall Today Lunch is Available to All Staff and Students at Lunch at The Food Truck which is located on the Football Field under the White Tent! Lots of Goodies available for only $4.00! A professional film crew will be working at Barsby today . This is great educational opportunity for our theatre students. Please try to reduce noise in the hallway outside of Chandler hall to make their job easier. Please note that the Barsby cafeteria will be closed today, but the film company food truck will be offering a choice of meals to students at a flat rate of $4.00. Also, for today, there will be no bells. Just move to your next class when it is time to do so. There will be no PA announcements; office staff will arrange for teachers of second block to receive written announcements to read out in class. Any students interested in rewriting the English 12 exam on April 25th Please sign up as soon as possible in the main office. Attention grade 12 students: Our VIU advisor, Shawn O’Toole, will be here at Barsby on Thursday to meet with students one-on-one. If you are attending, or would like to attend, VIU in the fall and have any questions for Shawn, please sign up for an appointment in the Counselling Office asap. In addition, Shawn O’Toole, will be at John Barsby on Monday, April 29 in the morning. Shawn will be running a registration session for students wanting to register for VIU. Please sign up in the Counselling Office asap. An average 3-4 Canadian workers die each day on the job. Three or four families that said goodbye to their loved ones when they left for work in the morning, families that were never able to welcome them home at the end of the day again. Young workers like us are statistically the most likely to be hurt on the job. Don’t be a statistic: insist on safety training, use safety equipment at work, and always exercise your right to refuse unsafe work. On Sunday, April 28th, the National Day of Mourning, remember those who have been injured or have died at work. Please, mourn them, but don’t be one of the mourned – stay safe at work. Are you an aspiring photographer? Do you love to take photos? Then submit any photos you’ve taken that showcase our school and post them on Instagram with the hashtag: #barsbylifephotography. The winner will be announced on May 1st. Check the Barsby-events Instagram for more information! Volunteering at Earth Day – or still thinking about it? Come to a brief meeting at lunch Thursday room 117. Or talk to Ms. Nelson. It’s that time! Time to order your cap and gown for your grad ceremony. Please complete an order form and return it to Ms. Rispin n the Counselling Office. Forms are available in the Counselling Office and Main Office. Need help with your homework. 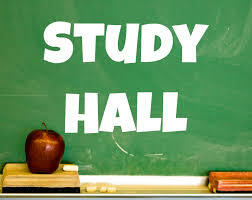 Come to study hall – Tuesdays and Thursdays after school in room 234. Help with any subject…and snacks too. Just a reminder that School starts every day at 8:30 Sharp!! A professional film crew will be working at Barsby today and tomorrow. This is great educational opportunity for our theatre students. Please try to reduce noise in the hallway outside of Chandler hall to make their job easier. Please note that the Barsby cafeteria will be closed today and tomorrow, but the film company food truck will be offering a choice of meals to students at a flat rate of $4.00. Also, for these two days, there will be no bells. Just move to your next class when it is time to do so. There will be no PA announcements; office staff will arrange for teachers of second block to receive written announcements to read out in class. John Barsby’s Queer Strait Alliance (QSA) continues today. Join us at lunch in Room 111. QSA is a safe and inclusive place for queer youth and their allies to be themselves. Everyone is welcome and QSA will continue on Mondays at lunch. Today, at lunch, the Barsby Leadership team will be a meeting in Room 236. Everyone is welcome to attend and help to make Barsby a better place. See you there! April 28th is The National Day of Mourning for Workers killed and injured on the Job. A day when we recognize and remember all those who have lost their lives just trying to provide for themselves and their families. Young and new workers run a greater risk of being hurt on the job than any other group. Every week an average of 7 young workers are permanently injured on the job in BC. Know your workplace right and safety procedures. Remember: Everyone has the legal right to refuse unsafe work. In addition…Shawn O’Toole, will be at John Barsby on Monday, April 29 in the morning. Shawn will be running a registration session for students wanting to register for VIU. Please sign up in the Counselling Office asap. It’s that time! Time to order your cap and gown for your grad ceremony. Please complete an order form and return it to Ms. Rispin n the Counselling Office. Forms are available in the Counselling Office. Don’t be alarmed at the sight of the American flag flying on Barsby’s flagpole — it’s only a prop for the filming of some episodes of Chesapeake Shores. This is a great opportunity for our theatre students to observe and be involved in a professional-level TV production, filmed on our very own Chandler Hall. The Numeracy Assessment is a graduation requirement. Any student who has already completed the Numeracy Assessment may re-write up to two times before graduation. Anyone wishing to re-write must register with Ms. Hill in the Main office by April 25, 2019 in order to write in June. Students currently enrolled in any Math 11 course will be registered automatically and are not required to register themselves. A detailed exam schedule will be published closer to exam time. Anyone with questions can see a counsellor, a math teacher, or Mr. Hasenauer in the Main Office. Happy Easter everyone! Student council has made an egg for every student and every staff member. If you find your egg, bring it to the front foyer at lunch for a sweet treat! Good luck, happy hunting and have a wonderful Easter! A professional film crew will be working at Barsby next week. This is great educational opportunity for our theatre students. Please try to reduce noise in the hallway outside of Chandler hall to make their job easier. Please note that the Barsby cafeteria will be closed Tuesday and Wednesday next week, but the film company food truck will be offering a choice of meals to students at a flat rate of $4.00. Location of food truck will be announced on Tuesday. Also, for these two days, there will be no bells. Just move to your next class when it is time to do so. There will be no PA announcements; office staff will arrange for teachers of second block to receive written announcements to read out in class. John Barsby is once again hosting an Earth Day Celebration this year on Saturday, April 27th, from 10-3pm. If you attended or volunteered last year, you would’ve seen the community come together. There was a market, goats, food and many different activities. This year there will again be live music, more delicious food, a market, opportunities to learn about helping the environment as well as many hands on activities. We need volunteers to make this event possible, and are hoping staff and students will sign themselves or their friends up. The sign up sheet to volunteer is in the main office…or Join us on April 27 and support your community and our Planet Earth. It’s that time! Time to order your cap and gown for your grad ceremony. Please complete an order form and return it to Ms. Rispin in the Counselling Office. Forms are available in the Counselling Office and Main Office. John Barsby’s Queer Strait Alliance (QSA) continues today. Join us at lunch in Room 111. QSA is a safe and inclusive place for queer youth and their allies to be themselves. Everyone is welcome and QSA will continue on Mondays at lunch. Please note the location change for QSA…meetings will now be in Room 111 from now on. Spirit Day is coming up on Wednesday, April 17th…The theme is Country vs. Country Club…please pull out your country gear, cowboy boots…hats and duds– or – Dress in your best Country Club upscale attire …Your Choice. Let’s raise some Spirit John Barbsy and have some Fun this Spirit Day! Please bring your field trip fees and permissions forms to Ms. Pennell Asap. Badminton – Practices this week will be Wednesday, Thursday and drop in on Friday right after school. Leagues will start soon. All members should attempt to make one of the practices. Drop ins are welcome. John Barsby is once again hosting an Earth Day Celebration this year on Saturday, April 27th, from 10-3pm. If you attended or volunteered last year, you would’ve seen the community come together. This year there will again be live music, more delicious food, a market, and opportunities to learn about helping the environment as well as many hands on activities. We need volunteers to make this event possible, and are hoping staff and students will sign themselves or their friends up. The sign up sheet to volunteer is in the main office…or Join us on April 27 and support your community and our Planet Earth. Practice time has changed Tuesdays and Thursdays to 4:30 -6:00 pm at the Rotary Bowl. Also please bring in your permission forms and Track and Field Fees to Mr. Hart or Ms. MacDonald ASAP. Practice is today Thursday at 3:15. All those who are able please attend or speak to Ms Moslin. Need help with your classwork or homework , computer access and a little more one-on-one time with a teacher? Go to room 234 on Tuesday & Thursday from 3 to 4:30 for help in any subject. Hope to see you there!